Download "5) a ) A. H. Calvert, S. J. Harland, D. R. Newell, Z. H. Siddik, A. C. Jones, T. J. McElwain, K. S. Raju, E. Wiltshaw, I. E. Smith, J. M. Baker, M. J." 1 1) B. Rosenberg, J. E. Trosko, V. H. Mansour, Nature, 222, 385(1969). 2) B. Rosenberg, L. Van Camp, T. Krigs, ibid., 205, 698 (1965). 3) E. Cvitkovic, J. Spaulding, V. Bethune, J. Martin, W. F. Whitmore, Cancer, 39, 1357(1977). 4) a) C. Sessas, F. Cavalli, S. Kaye, A. Howell, W. T. B. Huinink, T. Wagener, H. Pinedo, J. Vermorken, Proc. Am. Soc. Clin. Oncol., 4, 116(1985), b) V. H. C. Bramwell, D. Crowther, S. O'Malley, R. Swindell, R. Johnson, E. H. Cooper, N. Thatcher, A. Howell, Cancer Treat. Rep., 69, 409(1985). c) W. S. F. Wong, V. R. Tindall, J. Wagstaff, V. Bramwell, D. Crowther, J. R. Soc. Med., 78, 203(1985). 2 5) a ) A. H. Calvert, S. J. Harland, D. R. Newell, Z. H. Siddik, A. C. Jones, T. J. McElwain, K. S. Raju, E. Wiltshaw, I. E. Smith, J. M. Baker, M. J. Peckham, K. R. Harrap, Cancer Chemother.,Pharmacol., 9, 140(1982). b ) G. A. Curt, J. J. Grygiel, B. J. Corden, R. F. Ozols, R. B. Weiss, D. T. Tell, C. E. Myers, J. M. Collins, Cancer Res., 43, 4470(1983). c ) M. J. Egorin, D. A. Van Echo, M. Y. Whitacre, E. A. Olman, J. Aisner, Proc. Am. Soc. Clin. Oncol., 2, 28(1983). d ) B. D. Evans, K. S. Raju, A. H. Calvert, S. J. Harland, E. Wiltshaw, Cancer Treat. Rep., 67, 997 (1984). e ) S. Kaplan, R. Joss, C. Sessa, A. Goldhirsch, M. Cattaneo, F. Cavalli, Proc. Am. Assoc. Cancer Res., 24, 132(1983). f ) J. M. Koeller, R. H. Earhart, T. E. Davis, D. L. Trump, D. C. Tormey, ibid., 24, 162(1983). 6) T. A. Connors, M. Jones, W. C. J. Ross, P. D. Braddock, A. R. Khokhar, M. L. Tobe, Chem. -Biol. Interact., 5, 415(1972). 7) M. J. Cleare, J. D. Hoeshele, Platinum Metals Review, 17, 2(1973). 8) G. R. Gale, E. M. Walker, Jr., C. M. Atkins, A. B. Smith, S. J. Meishen, Res. Commun. Chem. Pathol. Pharmacol., 7, 529(1974). 9) R. Saito, Y. Kidani, Chem. 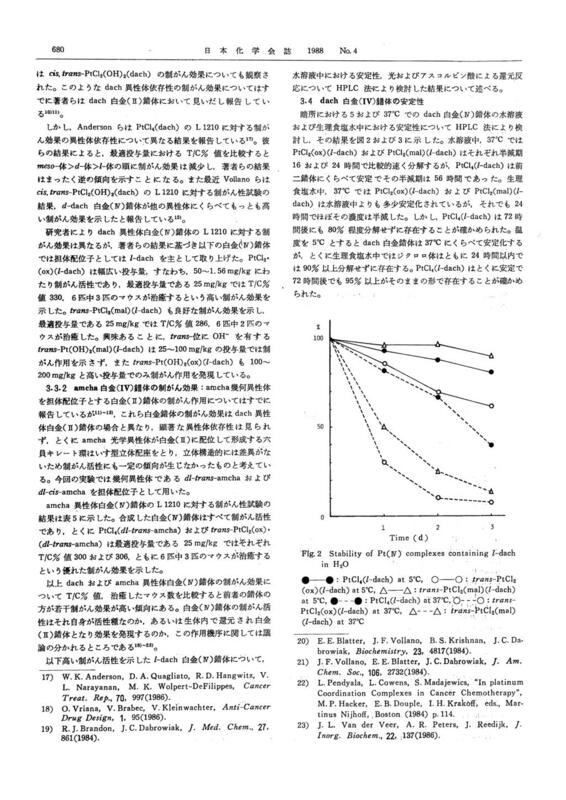 Lett., 1976, ) Y. Kidani, M. Noji, T. Tashiro, Gann, 71, 637(1980). 11) M. Noji, K. Okamoto, Y. Kidani, T. Tashiro, J. Med. Chem., 24, 508(1981). 12) Y. Kidani, K. Okamoto, M. Noji, T. Tashiro, Gann, 69, 863(1978). 13) K. Okamoto, M. Noji, T. Tashiro, Y. Kidani, Chem. Pharm. Bull., 29, 929(1981). 14) J. B. Brandon, J. C. Dabrowiak, J. Med. Chem., 27, 861(1984). 15) J. F. Vollano, A. Al-Baker, J. C. Dabrowiak, J. E. Schurig, ibid., 30, 719(1987). 4 16) H. Ito, J. Fujita, K. Saito, Bull. Chem. Soc. Jpn., 42, 1286(1969). 6 17) W. K. Anderson, D. A. Quagliato, R. D. Hangwitz, V. L. Narayanan, M. K. Wolpert-DeFilippes, Cancer Treat. Rep., 70, 997(1986). 18) 0. Vriana, V. Brabec, V. Kleinwachter, Anti-Cancer Drug Design, 1, 95(1986). 19) R. J. Brandon, J. C. Dabrowiak, J. Med. Chem., 27, 861(1984). 20) E. E. Blatter, J. F. Vollano, B. S. Krishnan, J. C. Dabrowiak, Biochemistry, 23, 4817(1984). 21) J. F. Vollano, E. E. Blatter, J. C. Dabrowiak, J. Am. Chem. Soc., 106, 2732(1984). 22) L. Pendyala, L. Cowens, S. Madajewics, "In platinum Coordination Complexes in Cancer Chemotherapy", M. P. Hacker, E. B. Douple, I. H. Kraktiff, eds., Martinus Nijhoff,, Boston, (1984) p ) J. L. Van der Veer, A. R. Peters, J. Reedi jk, J. Inorg. Biochem., 22,.137(1986). 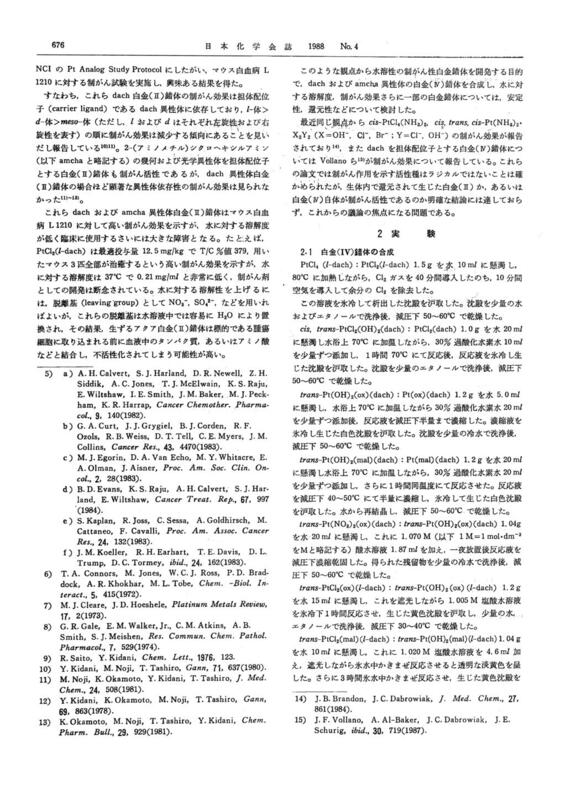 9 Special Articles on Coordination Chemistry of Biologically Important Substances Antitumor Activity and Property of Platinum (IV) Complexes Containing 1, 2-Cyclohexanediamine and 2-(Aminomethyl) cyclohexylamine Isomers Masahide Non*, Maki SUMI, Takayuki OHMORI, Mayumi MIZUNO, Kenjiro SuzuKI**, Tazuko TASHIRO*** and Yoshinori KIDANI Faculty of Pharmaceutical Sciences, Nagoya City University ; Tanabe-dori, Mizuho-ku, Nagoya-shi 467 Japan ** Department of Pharmacy, Tokai Teishin Hospital ; Matsubara, Naka-ku, Nagoya-shi 460 Japan *** Cancer' Chemotherapy Center, Japanese Foundation for Cancer Research; Kami-Ikebukuro, Toshima-ku, Tokyo 170 Japan We prepared platinum(w) complexes containing 1, 2-cyclohexanediamine (=dach) or 2- (aminomethyl)cyclohexylamine -(=amcha) as a carrier ligand in order to increase water-solubility of the corresponding Pt(1J) complexes. Their antitumor,activity was tested against murine leukemia L 1210, and almost all of the Pt(1V) complexes tested were antitumor active. Dach Pt(10 complexes showed higher antitumor activity than amcha Pt(1V) complexes and among the former complexes, Pt(1V) complexes containing l-dach exhibited higher activity than those of other dach isomers, i. e., meso-and d-dach. Especially, trans-ptc12(oxalato) (l-dach), trans-ptc12(malonato) (l-dach) and trans-1?tc12(oxalato)(d/-trans-amcha) exhibited excellent antitumor activity. In general, the reactivity of Pt(IV) complexes is low compared with that of Pt(I[) complexes and some researchers condider that Pt(1V) compleses themselves are not antitumor active, instead their reduced Pt(II) complexes are responsible for the activity. We found that dach Pt(IV) complexes were easily reduced by sunlight of ascorbic acid and the findings may support indirectly the above hypothesis. Table 1. Influence of food deprivation on gastric secretion and severity of ulceration in 18 hr pylorus ligated rats.